Nowadays, our world is in search of cleaner energy sources to power our increasing industrial and economic needs. Solar energy is becoming an alternative source to fossil fuels, but due to the accelerating pace at which we are consuming energy, we need to develop ubiquitous PV technologies that can be employed everywhere: on buildings, clothes, consumer electronics and wearables. This necessitates ultra-thin film, low-cost and ideally flexible solar cells without compromising the environment during production, use, or disposal. Now ICFO researchers Dr. Maria Bernechea, Dr. Nicky Miller, Guillem Xercavins, David So, and Dr. Alexandros Stavrinadis, led by ICREA Prof. at ICFO Gerasimos Konstantatos have found a solution to this increasing problem. 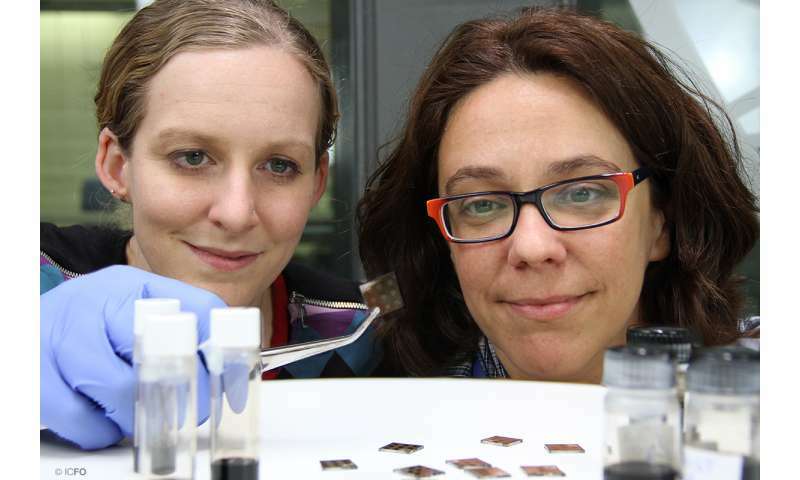 They have fabricated a solution-processed, semi-transparent solar cell based on AgBiS2 nanocrystals, a material that consists of non-toxic, earth-abundant elements, produced in ambient conditions at low temperatures. 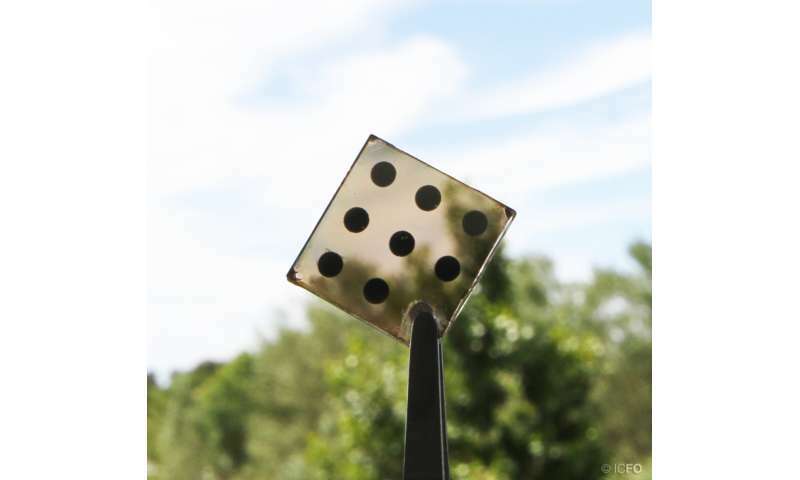 These crystals are strong panchromatic absorbers of light and have been further engineered to act as an effective charge-transporting medium for solution-processed solar cells. What is special about these cells? As researcher Dr. Maria Bernechea comments, "They contain AgBiS2 nanocrystals, a novel material based on non-toxic elements. The chemical synthesis of the nanocrystals allows exquisite control of their properties through engineering at the nanoscale and enables their dissolution in colloidal solutions. The material is synthesized at very low temperatures (100ºC), an order of magnitude lower than the ones required for silicon based solar cells." The team of researchers at ICFO developed these cells through a low temperature hot-injection synthetic procedure. They first dispersed the nanocrystals into organic solvents, where the solutions remained stable for months without any loss in device performance. Then the nanocrystals were deposited onto a thin film of ZnO and ITO, the most commonly used transparent conductive oxide, through a layer-by-layer deposition process, until a thickness of approximately 35 nm was achieved. "A very interesting feature of AgBiS2 solar cells is that they can be made in air at low temperatures using low-cost solution processing techniques without the need for the sophisticated and expensive equipment required to fabricate many other solar cells. These features give AgBiS2 solar cells significant potential as a low-cost alternative to traditional solar cells," Dr. Nicky Miller says. These cells have already achieved power conversion efficiencies of 6.3 percent, which is on par with the early reported efficiencies of currently high performance thin film PV technologies. This highlights the potential of AgBiS2 as a solar-cell material that in the near future can compete with current thin film technologies that rely on vacuum-based, high-temperature manufacturing processes. As ICREA Prof at ICFO Gerasimos Konstantatos concludes, "This is the first efficient inorganic nanocrystal solid-state solar cell material that simultaneously meets demands for non-toxicity, abundance and low-temperature solution processing. These first results are very encouraging, yet this is still the beginning and we are currently working on our next milestone towards efficiencies > 12 percent".